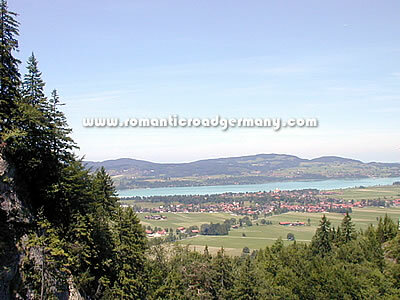 Schwangau is the penultimate town on the route south along the Romantic Road. Smaller than its bustling neighbour Füssen, it boasts however one of the most popular "sights" in the whole of Germany. But not everything revolves around Ludwig's "fairytale castle, and the villages of Schwangau and Hohenschwangau and the nearby surroundings boast some gorgeous lake and mountain scenery which will suit any traveller bursting for some activity on their own away from the towns and history of the Road. Schwangau, in its position at the foot of the mountains and surrounded by lakes, was a popular location for settlement dating back into the Stone Age. With the Romans and their construction of the Via Claudia Augusta through to present-day Augsburg, Schwangau became a military base. The remains of a private Roman bathing house have been discovered at the base of the Tegelberg cable car during work on the lift and there are remains of other villas in the region. As the Romans withdrew over the centuries, the area was take over by various Germanic tribes. Following the arrival of Christianity in the 8th century, the first official mention of the name Schwangau is made in a document from the 11th century, referring to fortifications on the hill where Neuchwanstein Castle now stands. The settlement and the castles above it changed hands many times over the centuries, effected especially by the financial problems which plagued the noble owners and the repeated outbreaks of the plague. Eventually, the former castles were left as ruins, until Maxmilian II rebuilt Hohenschwangau Castle in the early 19th century and his son, Ludwig II, started on the construction of the fabulous Neuschwanstein Castle in the late 19th century. At the turn of the century, the advent of mountain tourism and especially the concept of a "cure" in the mountain air started to influence the local economy and the first hotels and pensions were built. Neuschwanstein Castle and its alpine setting remain a potent attraction for the area and indeed for regional tourism.